Machu Picchu is a true architectural gem. The beauty and mystery of its stone palaces is enhanced by the magnificent, almost virgin and abrupt geography colored green by exhuberant jungle flora. The constructions were built harmoniously on the narrow and uneven surface of a cliff surrounded by the precipices of the imposing Urubamba Canyon, where 400meters below, the river roars and meanders. Machu Picchu is located at 2.400 masl ( 7.847 fasl), on the top of a plateau located between two peaks. From these two, the smallest, the Huayna Picchu Is the one that defines the topography of the site. As centuries went by the original name of this ruins fell into oblivion. 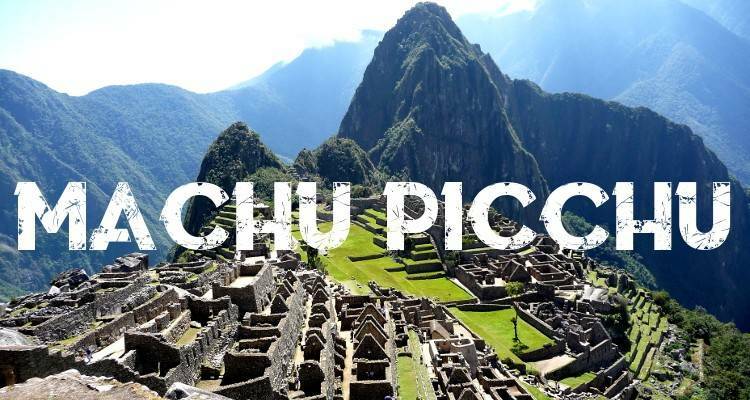 In fact, Machu Picchu is just a topographic denomination that means “Old Mountain” , while the Huayna Picchu means “Young Mountain”. In this case the translation must keep a correlation with the concept of volume so as to mean “major summit” and “mirror summit” respectively. Ever since its discovery en 1911, Machu Picchu has been a true and insoluble archaeological enigma. Even nowadays scholars are intrigued by its history and function, and it is possible that these mysteries will never be totally unraveled. 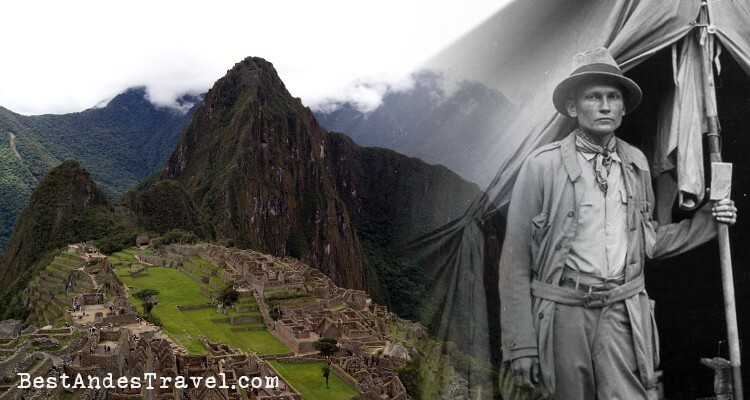 Hiram Bingham, a north-American scholar who was leading an expedition from Yale University, discovered Machu Picchu on July 24th 1911. However, at the time, Hiram Bingham was mainly focused on finding Vilcabamba, the legendary capital of incas descendants, and bastion of the resistance against the Spanish from 1936 to 1572. After this transcendent finding, Bingham returned to the site en 1912 and in the following years (1914 and 1915), many explorers made maps and explored in detail both the site and its surroundings. Their excavations, though not very orthodox, in many different places of Machu Picchu allowed them to gather 555 vases, close to 220 bronze, copper and silver objects. The pottery found shows fine expressions of inca art; this also applies for the metal objects found: bracelets, earrings, decorated brooches, and knives and axes. Even though no gold was found, the material identified by Bingham was enough to infer Machu Picchu dates back to the timesof Inca splendor, something that was already evidenced by its architectural style. Bingham also recognized other important archaeological sites in the surrounding areas. Among these were, Sayacmarca, Phuyupatamarca, the fortress of Vitcos, and important portions of inca trail, all of them superb examples of incas architecture. 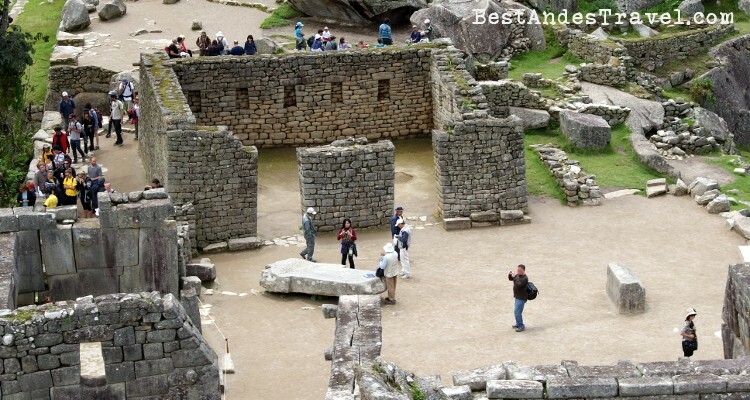 Both the remains found and the architectural lead researches to relieve that the Machu Picchu Citadel was erected towards the end of the 15th century and the beginning of the 16th , during inca times. However, the site inhabited after the Spanish invasion, at least during the 16th century. With time, Machu Picchu was forgotten or just remembered in the mist of the legend, until its scientific. After its discovery it became the symbol of our nation, and the greatest patrimony inherited from our ancestors. Temple of the Sun viewed from above. Located at 120 km to the northwest of Cusco on the valley of the Urubamba River (name given to Machu Picchu constitutes one of the most important archaeological sites in the world, and Peru’s main tourist destination. Few things made by humans maintain such harmony with is natural surrounding and adjacent archaeological groups. 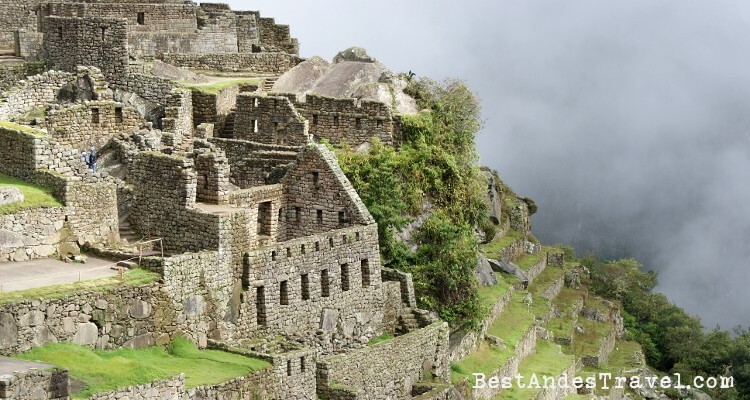 The archaeological sites is strategically located on the peak of the Machu Picchu Mountain (quechua name for “old or major mountain”) that gives the name to the citadel and the spectacular setting we all have seen in photographs. Facing this mountain in the Huayna Picchu (young mountain) where it is also possible to find archaeological remains on its peak. Both peaks are surrounded by the mighty Urubamba River, which runs east through the canyon almost half a mile below the citadel. 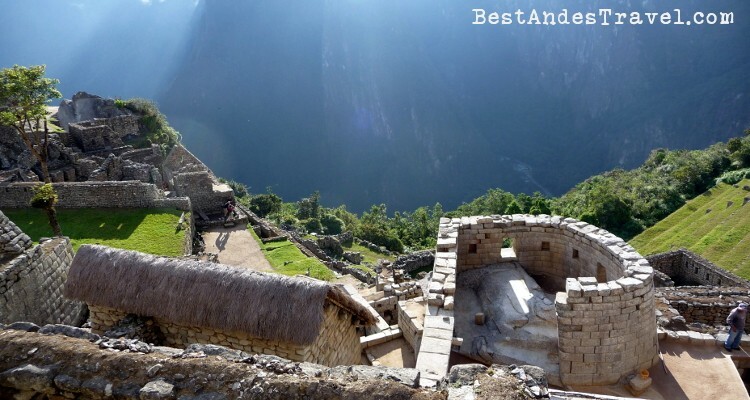 In Machu Picchu it is possible to distinguish two different zones: the agricultural zone that contains a vast network of terraces, the urban zone, divided in a sacred zone (temples, monuments, funerary chambers) and the civil zone (rooms, diverse precincts and storage rooms). The constructions found in Machu Picchu give testimony of the amazing skills and techniques used to work the rock. Studies carried out show that it was built as a complex in a simultaneous and uninterrupted way. Among the most interesting architectural precincts it is possible to find the so-called Royal Tomb, located close to the entrance of the Citadel, the temple of the Sun, the Tower (the only structured with a circular form), the Priestly Mansion, the Temple of the Three Windows, the Catedral Temple, the Plaza and the fountains and channels that form the “Baños del Inca” (the Inca Baths). The hydraulics channels and stairs, made completely out of rock, are other characteristic elements of the citadel. At last, it is also possible to find monoliths of great ritualistic importance, among which the Intihuatana (“where the sun is tied”), the most sacred space of the sites, stands out.